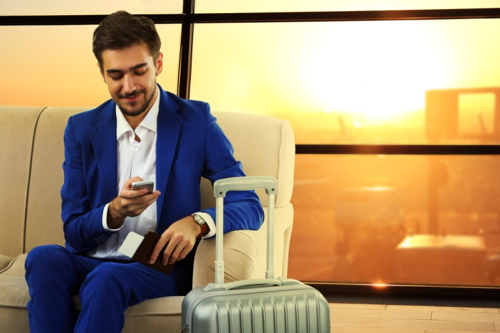 Mobile devices have revolutionized business travel, allowing everyone to stay connected and productive on the road. They’ve also made it easier for hackers to gain access to company networks and data, especially when unsuspecting business travelers don’t take the right precautions to keep their devices safe and away from prying eyes. In fact, hundreds of thousands of mobile devices and laptops are lost or stolen every year. The majority of devices disappear in transportation (i.e., being left in a taxi or stolen from a vehicle), and at hotels and in airports. And when you consider the amount of information that’s potentially available in all of those devices, well, it’s actually somewhat surprising that we don’t have more major data breaches than we already do. 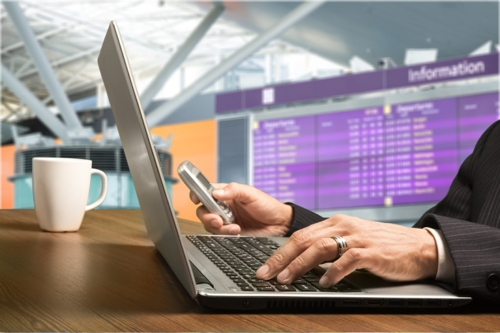 Because it’s so easy to misplace a mobile device in a crowded airport, or have a hacker access your data without you even noticing, it’s vital for business travelers to take extra precautions to keep everything safe and secure while they’re on the road. Some of these tips may seem rather simple, but they can mean the difference between a safe and productive trip and a major data security headache. About a third of all mobile phone users lock their phones with a password — and even less use biometric features like a fingerprint swipe. However, these features can thwart most low-level criminals and keep them from accessing the information on your phone. Ideally, you should set up your device so that you use both a passcode and biometric authentication, so even if a smarter thief can crack the code, he still can’t access your phone. To protect your data in the event your device is lost or stolen, enable the “find my device” feature if offered, and the remote lock and wipe capabilities. That way, if the device does fall into the wrong hands, you can at least keep the thief from accessing your data. You might be surprised how much information is on your device — information that hackers can use to steal even more information from your company. Before you travel, turn off all automatic logins for apps, including personal apps like your social media accounts and banking. If you have the option to set up a two-factor or biometric authentication process, do so. While you’re cleaning up, clear your device’s web history, as it could reveal information about what you are working on or give hackers clues about where to find more information. In addition to removing unnecessary information from your device, make sure that the operating system and all applications are updated before you head out of town. Hackers often exploit weaknesses in apps and systems that aren’t up-to-date, so installing patches and updates can help keep harmful malware out. Installing powerful mobile security tools, such as antivirus for your phone, can add another layer of protection against harmful software. Nothing is better than free Wi-Fi, right? Wrong. Free and public Wi-Fi networks are like the Wild West when it comes to security, and one of the easiest ways for hackers to spy on you and steal information. It’s common, for instance, for criminals to hang out where business travelers often try to get work done (including coffee shops, hotel lobbies, and even airports) and set up spoofed Wi-Fi networks, in hopes that unsuspecting workers will log on. The hacker can then see everything that you do online — including passwords, private emails, and more. Even if the hacker doesn’t set up a spoofed network, they can still hack into the network and capture all sorts of information. Paying for Wi-Fi or using a password-protected network at a hotel or conference center isn’t necessarily a safer option, either. Public networks simply do not have the same security protections that your company network does, making your data vulnerable to theft. Instead, ask your company IT department to supply a Virtual Private Network (VPN) for use while you are traveling, which will keep everything out of view of hackers. Some cybercriminals use decidedly low-tech methods to steal information from travelers: They just eavesdrop, or read over your shoulder. Keeping your screen tilted away from others and using a privacy screen can prevent others from seeing what you’re doing. Travel experts also recommend turning off Bluetooth and Wi-Fi when they aren’t in use, and disabling location services on your devices, so that your location remains anonymous. Keeping your mobile devices safe during business travel doesn’t require hiring armed guards or resorting to old-fashioned methods of communication. It does, however, require being aware of your surroundings and taking basic precautions to keep your device and the data it contains safe and secure. They only take a few moments, but can prevent a great deal of lost time and money.